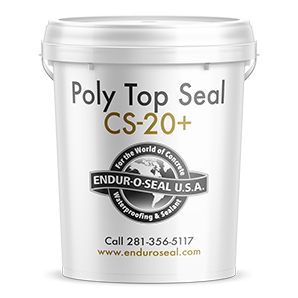 EOS Poly Top Seal CS-2O PLUS is a high technology, aqueous based, rapid acting, penetrating Polysiloxane sealer that protects floors, driveways, sidewalks, patios, buildings, columns, and other concrete structures against damage due to water penetration. EOS PTS CS-20 PLUS provides long lasting protection against efflorescence (alkali salts and lime leaching), Staining due to atmospheric carbons, mold, mildew, surface rust, salts, chloride penetration, corrosion, acid rain, dampness, waterproofing basements and other water related damage. EOS PTS CS-2O PLUS is frequently used over one or two applications of EOS Hydra Seal or Hydra Loc deep penetrating sealers where the customer requires rapid water shedding and resistance to moisture vapor transmission or beading. Reduction of ice build up and or easy ice removal. EOS PTS CS-2O PLUS will penetrate most latex based paints. Not recommended for use on pre-cast foam filled panels. Product must be thoroughly mixed before use, mixing tool included with shipment. EOS PTS CS-2O PLUS is VOC compliant. This product has a 45 day shelf life without the catalyst mixed. Once the catalyst has been added to the 5 gallon container, the shelf life is 15 days.